Learn more about low carb and how to use it for your personal goals here. 1. What is low carb? Below are examples of what you could eat, alternatively check out our 700+ low-carb recipes. Who should NOT do a strict low-carb diet? If you’re not in any of these groups, you’re good to go! This guide is written for adults with health issues, including obesity, that could benefit from a low-carb diet. Controversial topics related to a low-carb diet, and our take on them, include saturated fats, cholesterol, whole grains, red meat and restricting calories for weight loss. Do you want to get going with low carb right away? Make it truly simple by signing up for our free two-week low-carb challenge. Or get unlimited meal plans, shopping lists and much else with a free membership trial. In this section you can learn exactly what to eat on low carb, whether you prefer visual guides, detailed food lists, delicious recipes or a simple get started guide. All foods above are below 5% carbs. Sticking to these foods will make it relatively easy to stay on a strict low-carb diet, with less than 20 grams of carbs per day. Here’s what you should not eat on low carb – foods full of sugar and starch. These foods are much higher in carbs. The numbers are grams of digestible carbs per 100 grams (3.5 ounces), unless otherwise noted. The occasional glass of wine is fine too. For more, check out our complete guides to low-carb drinks and low-carb alcohol. How low carb is a low-carb diet? The fewer carbohydrates you eat, the more powerful the effects on weight and blood sugar appear to be.17 For that reason we recommend initially following the dietary advice fairly strictly. When you’re happy with your weight and health, you may carefully try eating more carbs (if you want to). A strict low-carb diet is often called a ketogenic (or “keto”) diet. Keen to get started? Then sign up for our free 2-week low-carb challenge, where you’ll be guided step-by-step through your low-carb journey. We have written advice on a low-carb diet in 40 languages, including our full Diet Doctor site in Spanish or Swedish. However, the reason many people keep eating low carb is often the powerful health effects, like the following ones. The links below share more inspiring testimonials and scientific research about potential low-carb benefits. To make a low-carb diet truly simple and enjoyable requires a few new skills. For example, how do you cook low-carb breakfasts that you love? How do you eat more healthy fats? And what’s important to think about when dining out? Here are all the guides you need. Breakfast is a great time to eat low carb. Who doesn’t love bacon and eggs? In the unlikely event that you answered “I”, there are even great options with no eggs at all. Another strong option is to just have a cup of coffee, as many people get less hungry on a low-carb, high-fat diet and may not need breakfast at all.35 This can save you plenty of time. So, what’s for lunch and dinner on a low-carb diet? You could for example have meat, fish or chicken dishes with vegetables and a rich full-fat sauce. There are a million alternatives. Who needs starchy sides when you can have cauliflower mash or cauliflower rice instead? Not to mention butter-fried green cabbage, yum! It’s very possible to eat low carb even when leaving your house, for example at restaurants. Just avoid starchy foods and ask for some extra natural fat (e.g. olive oil or butter). Do you have a hard time living without bread? Fat can be both satiating and an amazing flavor enhancer. But how do you get in enough of it in your diet? And how much fat should you really eat? Hint: enough to feel satisfied and not hungry. Many who are eating a low-carb diet can get seduced by creatively marketed “low carb” products — cakes, cookies, candies, chocolate, pastas, breads, ice cream and other substitute foods. A low-carb diet doesn’t have to be expensive. In this guide, you’ll learn how to make it cheap. Do you want more low-carb guides? We have more low-carb guides! If you stop eating sugar and starch cold turkey (recommended) you may experience some side effects as your body adjusts. For some people these side effects are mild, while others find the transition more difficult. It usually lasts a few days, up to about a week, and there are ways to minimize it. Another option is to decrease the intake of carbohydrates slowly, over a few weeks, to minimize side effects. But the “Nike way” (Just Do It) may be the best choice for most people. Removing most sugar and starch often results in several pounds lost on the scale within a few days. This may be mostly fluids, but it can still be great for motivation. Here are side effects that may occur when you suddenly start a strict low-carb diet. By far the most common side effect is called the induction flu. It’s what makes some people feel really poorly for a few days (up to a week) after starting low carb. The primary reason for this may be that carbohydrate-rich foods can increase water retention in your body.37 When you stop eating high-carb foods you’ll lose excess water through your kidneys. This can result in dehydration and a lack of salt during the first week, before the body has adapted, resulting in the symptoms above. Here’s the sixth and final section of this low-carb page. Do you want to truly understand low carb, and get answers to your remaining questions? Or do you want extra inspiration for yourself or for people you’re trying to help? Find it here, and start becoming a low-carb expert. Get insight, enjoyment and inspiration to help you succeed, from the top low-carb channel on the planet. What are you designed to eat, and why can sugar and starch be a problem? Essentially, how does a low-carb diet work? Are you having problems on low carb? Are you not losing weight like you want to? 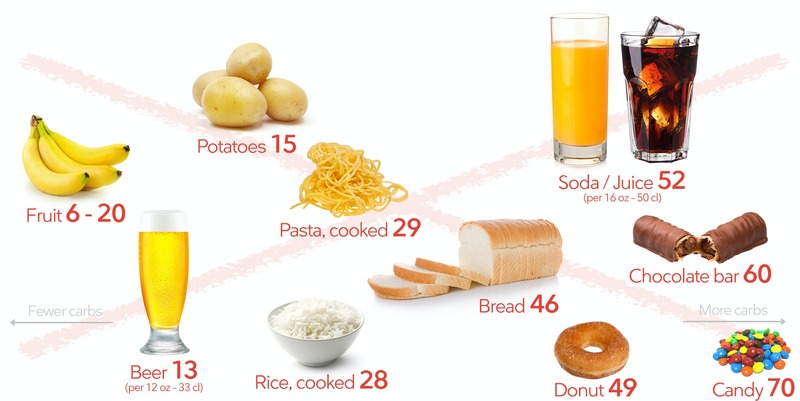 How many carbs should you eat? Do you want to learn much more, and meet experts and other people who are interested in low carb? Here’s a current list of upcoming low-carb conferences and other events. Do you want a summary of the ongoing food revolution? From failed low-fat diets and an epidemic of obesity and diabetes, through a growing realization of our mistakes, and towards a potential health revolution. Success storyGet inspired by hundreds of stories written by people that changed their lives for the better just by eating real food. For many more studies on the topic, have a look at our low-carb science page. A keto diet is a common name for a very strict low-carb diet, containing very few carbohydrates, generally below 20 grams per day. This usually results in a metabolic state called “ketosis”, hence the name. Nutrition and Metabolism 2006: Comparison of isocaloric very low carbohydrate/high saturated fat and high carbohydrate/low saturated fat diets on body composition and cardiovascular risk. Our weight is hormonally regulated. Eating fewer carbohydrates lowers blood glucose, lowering the fat-storing hormone insulin. This often makes it way easier to access and burn excess body fat, without hunger or calorie counting. While calories count, you probably don’t have to count them for good results. This has been demonstrated in studies (see below). Learn more here: Should you count calories on a low-carb or keto diet? There is not yet an RCT that test two low-carb diets of varying strictness head-to-head. But RCTs of strict low-carb diets appear to often show better results, compared to RCTs of more moderate or liberal low-carb diets. There is still a shortage of high-quality studies, but what exists is promising, sometimes showing remarkable improvements. Like anything else that can be highly rewarding – gambling, drugs, etc. – sweet processed foods can result in addiction issues. Note that it’s likely not just a specific substance – e.g. sugar – that is the culprit leading to addiction, but rather the full rewarding experience of certain foods, e.g. sweet chocolate. Here are a few papers discussing this issue. This is likely mostly caused by avoiding the foods that can cause a food addiction, most of which are processed foods full of sugar and/or other refined carbohydrates. Just like with any other addiction, avoiding the cause is a necessary part of slowly reducing the addiction. A person who is addicted to alcohol normally can’t consume alcohol “in moderation” and be successful. The same thing is likely true for any addiction. Most of these potential benefits have strong or moderate scientific support (see references higher up on the page). Regarding mental clarity, this is something that is often reported by people on a strict low-carb diet [very weak evidence]. There is likely a positive effect of low-carb diets on PCOS, a common hormonal problem for women that can impact fertility. E.g. one or two cups of bouillon per day.